Robin Williams was found dead by suicide this morning. I confess I'm reeling. This caught me broadside. His comedic work is incredible and the world has lost a true virtuoso. A late friend of ours had an encounter with Robin Williams many years ago. Read about it here. I didn't agree with his politics, but I deeply appreciated his humor and wit. Rest in peace, Mr. Williams. Heaven certainly gained a gem. Really? I have never heard him state his belief in Jesus as his Lord and Savior. Not once. Because stating it or not would make it so? Belief is in your heart not your mouth. No one can judge another's salvation, but the fruits of repentance will be evident in those with a true saving faith. in their speech and actions. I don't know much about RW's recent life, but I have watched him in the past and have heard him scoff at Christianity and the Bible, not to mention the vulgarity in his performances. I hope he turned to Christ in his last moments/hours/days in faith and repentance, I would love to see him again someday. There is no resting in peace in eternity for any of us apart from Christ. Romans 10:9. If you CONFESS with your MOUTH that Jesus is Lord , and believe in your heart that God raised Him from the dead, you'll be saved. Matt. 12:34 Out of the abundance of the heart, the mouth speaks. Everyone jumps on the "he's in a better place" mantra. In reality, we should use someone's death to examine our own heart and ask forgiveness while we are still breathing. What an incredible story. What an incredible experience. My heart jumped from my chest when I read this earlier today on Yahoo. Mr. Williams could make me laugh until I cried. I loved his movie "Good Morning, Viet Nam." I laughed until my sides hurt. Then I saw his movie "Moscow on the Hudson." His portrayal of a Russian musician who defects in a Bloomingdales store in Manhattan left me breathless the first time I saw it. His humility and vulnerability jumped right off the screen. It still makes me teary when I watch it. I liked the story about your friend who traded jokes with him unknowingly. 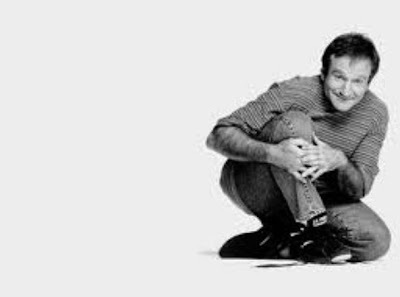 I'm so sorry that, if this turns out to be a suicide, Robin Williams felt he had no other way out of his black hole. It's so sad to know he's gone. What a loss. He gave us laughter and decency -- and undeserved stature as a species. Tears-under-laughter: the comedic alchemy. The Dead Poets Society has stayed with me for many years. My husband also brought up the question as to whether or not RW was saved. I don't remember hearing RW profess faith in Jesus Christ, but then maybe he did, I didn't really follow his career. I do hope he had saving faith, if not, it's too late now. He seemed like such a kind and gentle soul. Now reports of his quiet philanthropic nature are streaming into the news outlets. Christian or not, he helped many people through his charitable acts and his comedic work. Sad that someone seemingly so jovial on the outside could suffer in so much inwardly. My teenage daughters admired his professional work. They brought his death to my attention with tears in their eyes. While he didn't live by my brand of politics or faith, I'm glad to know they admired him rather than the host of filth on the entertainment stage today. Prayers of peace to his family as they cope with his passing. He will be missed.